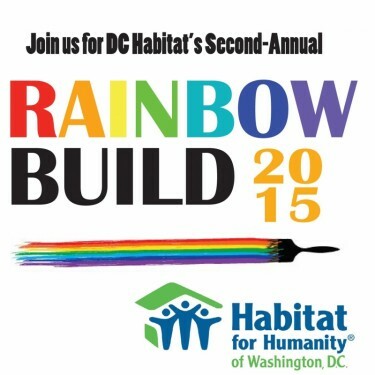 WASHINGTON, March 23, 2015 — This June, Habitat for Humanity of Washington, D.C. (DC Habitat) will hold its second Rainbow Build event, in partnership with Capital Pride and the DC Center. The goal of Rainbow Build is to raise awareness for the cause of affordable housing, particularly as it relates to LGBTQ and other social justice issues, and to team up with a diverse array of LGBTQ organizations, groups and individuals to work towards the elimination of poverty housing in DC. This year’s Rainbow Build event, coinciding with DC Pride Week, will center around a series of team build days in June (18th-20th), during which members of LGBTQ groups and organizations in DC will build together on a Habitat home in Northeast DC. From March through June, DC Habitat will be promoting an online fundraising campaign at crowdrise.com/2015rainbowbuild. All proceeds from this campaign will go directly to Rainbow Build, and towards Habitat’s mission of alleviating poverty housing in the District. Habitat for Humanity believes that everyone deserves a decent place to live, and that housing equality is an issue of social and economic justice for all people. Through Rainbow Build, DC Habitat aims to create a stronger platform for discussion and a lasting partnership within the LGBTQ community for sustainable change and improvement in DC’s housing market. “Given the success of last year’s event, we’re excited to bring Rainbow Build back to DC for a second year in a row, and to engage more members of the DC LGBTQ community in our cause,” said DC Habitat President and CEO Susanne Slater. Habitat for Humanity of Washington, D.C. believes that everyone deserves a house they want to call home. That’s why we work to eliminate poverty housing in the nation’s capital by building affordable, energy- and resource-efficient homes for people in need. DC Habitat builds and rehabilitates homes in order to sell them to families who are ineligible for conventional financing. Visit us atwww.dchabitat.org for more information.